I have done something that is perhaps foolish, but with only good intentions. I have committed to creating a piece of jewelry every day for 30 days. There are any number of reasons to do such a thing. I want to have the motivation to post daily again, I want to have the motivation to create something every day- and I want to actually set all these lovely cabochons,So barring the highly unexpected- flood, fire, or extreme acts of Illness- I’m going to try to make one piece every day from start to finish, and post it to my blog. 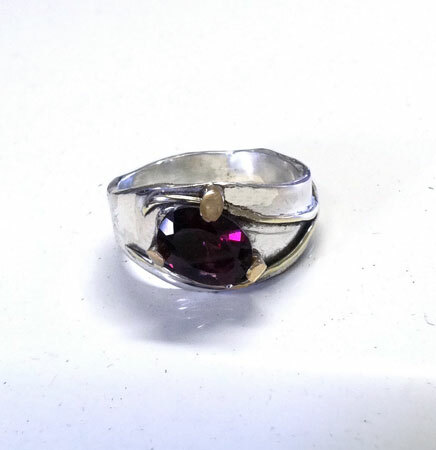 Hand forged silver with 14K white and yellow gold accents featuring a stunning color change garnet.